Go from CAD to sintered part -- without leaving the office. 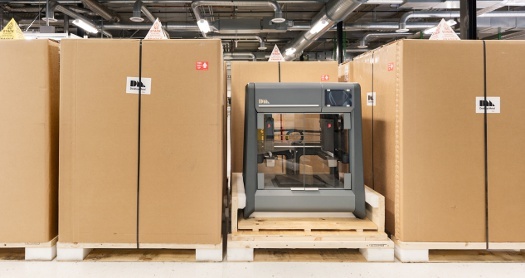 Just eight months after its initial introduction, Desktop Metal has begun shipping its metal 3D printer to early pioneer customers as part of the Studio System rollout. As a partner in Desktop Metal's Pioneers Program, Google's Advanced Technology and Products (ATAP) group is the first pioneer to receive the Studio printer. Inaugural Pioneer customers in the program span six industries: heavy machinery, consumer electronics, automotive, service bureaus, machine shops, and government and education. Benchmark parts range from tooling, prototyping, and jigs and fixtures to end-use parts for functional applications. The Studio System is the first office-friendly metal 3D-printing system for rapid prototyping and, according to its developer, is 10 times less expensive than existing technology. The Studio System is a complete platform, including a printer (starting at $49,900), a debinder, and a microwave-enhanced sintering furnace that, together, deliver metal 3D-printed parts in an engineer's office or on the shop floor. The machine's designers eliminated lasers and powders to make the Studio System safe for any facility. Unlike other systems, there are no requirements for third-party equipment or special facilities -- just power and an internet connection. The Studio System supports a wide range of alloys for 3D printing, including stainless steels, copper, and tool steels. Each alloy undergoes rigorous qualification by world-leading materials scientists, and core materials consistently meet or exceed industry standards. There are also more than 30 other alloys available for R&D. Get the full data sheet PDF here. "Since the launch of our Pioneers Program, we have seen really passionate engineers and world-class companies begin to develop benchmark metal 3D-printed parts with the Studio System," said Ric Fulop, CEO and co-founder of Desktop Metal. "Over the next several months, we will be working closely with each to learn more about how engineers want to use our system." Pioneer customers also include: U.S. Navy's Naval Surface Warfare Center Dahlgren Division, Built-Rite Tool & Die, The Technology House, Medtronic, and Lumenium LLC. Each Pioneer will receive the Studio System over the coming months, with broader distribution to those who reserved the system in early 2018. Additionally, more than 30 other U.S. sales partners will be receiving the Studio System to begin the process of offering product demonstrations and creating benchmark parts for interested customers. "This marks the first time our team will be able to use metal 3D printing for rapid prototyping of our hardware parts," said David Beardsley, manager of Google's ATAP. "For prototyping, we have previously relied upon casting or using plastic 3D printing. Now with the Studio System, our team will experience shorter lead times, faster product development cycles, and the benefits of functional prototypes in an array of metals on demand and in the lab." Desktop Metal is currently taking reservations for the Studio System. The company also has a larger, faster model called the Production System. Popular Science recognized the Desktop Metal Production System with its "2017 Best of What's New" award in the Engineering category.